I hope you have had a wonderful holiday season and have been enjoying the new year. I do love the possibilities that a fresh, new year brings. This past year has brought me many blessings and changes--I took an incredible oil painting workshop on Bainbridge island where animals were the main focus -- I felt I had found my people! I interviewed with KOMO-TV's Seattle Refined back in March which was very exciting and of course had a busy holiday season creating commissions for cherished pets. I hope you will be able to join me for an upcoming show at Northwest Cellars in Kirkland this February through March 2018. 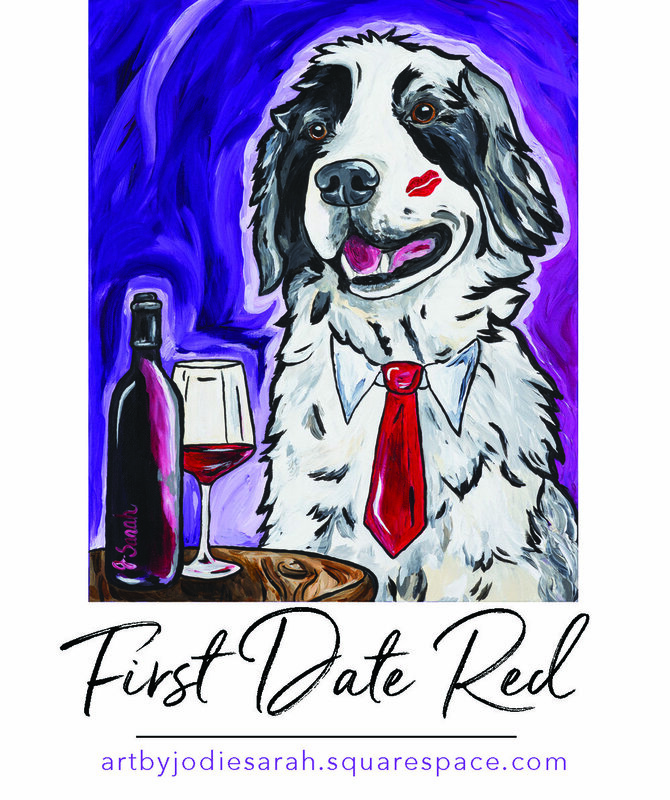 Northwest Cellars will be featuring my artwork, "First Date" 16" X 20" on it. The label will be an exclusive for Valentine's Day and the month of February available only at Northwest Cellars. "First Date" as well as several other originals and prints will be available for sale. Come and join me for a tasting -- the wine at Northwest Cellars is excellent! Northwest Cellars is located at 11909 124th Avenue NE, Kirkland, WA 98034. It's exciting and gratifying to see my artwork on a wine label--I believe it lends itself well to it. A complete list of venues is on the side of this blog. You're welcome to email me as well at jodiesarahartist@gmail.com for more information. Wishing you the best and much happiness in 2018! See you soon.